Maybe some day geographical boundaries will give way to some other way of clustering and organising and administering human societies. Maybe some day the nation state will become obsolete. But not yet. The sovereign nation state is still the basic unit of organising human societies. Without sovereignty within its geographical boundaries, a nation state cannot exist. (A nation state which cannot protect its geographic boundaries and its sovereignty cannot survive). Without nationalism as the foundation stone, internationalism falls down. Without the brick of unilateralism as the fundamental building block, no multilateral structure can exist except as a castle in the imagination of mindlessness. 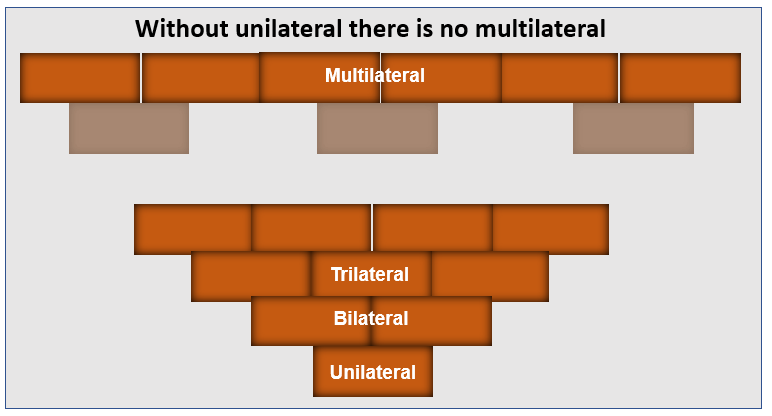 What is often conveniently forgotten with the multinational or multilateral organisations (UN, EU, IMF, WTO, WHO, …..) is that the multilateral (or multinational) is meaningless without maintaining the integrity of the unilateral (or the national). Undermining the unilateral leaves the multilateral floating aimlessly. Multilateral is a service provider to the unilateral. Without a customer a multilateral service is of no consequence. It is an existential question of identity. What the EU does not like to accept that its citizens are Germans or French or Swedes first and only Europeans second.